March 6, 2013 By Allyson 1 Comment This post may contain affiliate links. Read my disclosure policy. 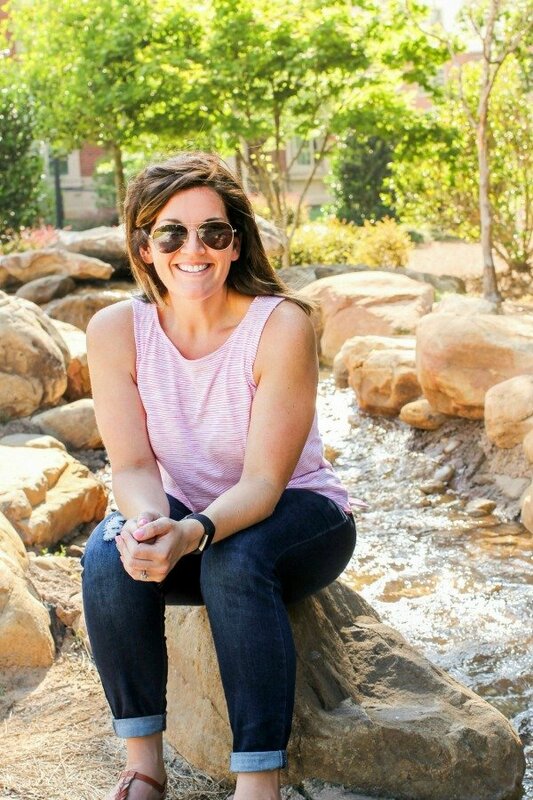 Today we have another guest post from Shannon! If you didn’t see her first guest post, Guiltless Fettuccine Alfredo, I highly suggest you check it out! Here she has whipped up her take on Barbacoa (and I am embarrassed to admit that I had not even heard of this!). Looks tasty! Meal planning and grocery shopping is an art form for me. By the time I’m done with my weekly grocery list, it is full of notations. I star items for which I have coupons, mark BOGO deals and other weekly specials, and mark which stores some of the items will come from. I don’t have time to shop around at 27 different stores to find the best deals. I’ve found though, that what works best for me is hitting two stores each week. My area has a HUGE grocery store, complete with its own Starbucks and fancy cheese counter. I don’t go there. I go to the other side of town, where there is an Aldi and one of our grocery stores (a much smaller version) right next to each other. This makes it MUCH easier to go to two stores without wasting time, and it is much more efficient to be in smaller stores (with far fewer temptations!). Since I broke up with my fancy grocery store and started going to Aldi first, I have saved a TON of money. I used to almost always go over my grocery budget. Now, I never spend all of it, even when we need dog food or supplies for a party. Aldi’s produce is SO cheap…we have been eating fresh fruit this winter, instead of pre-packaged fruit cups, and it is fantastic! I realize I’m late to the game on discovering Aldi, and that many of you probably have been shopping there forever. Forgive me, I’m slow sometimes. The one thing I am a little hesitant to buy at Aldi is meat. There’s probably nothing wrong with it, and I have purchased it a few times, but for some reason I still prefer to buy that at my local grocery store. As a general rule, I wait until there are BOGO meat sales, and then I stock up. This finally leads me to the point of this post. My grocery store had BOGO pork roasts last week, so I picked up two of them. When I got home, I found that we still had one in the freezer. With a plethora of pork, I needed some new recipe ideas. 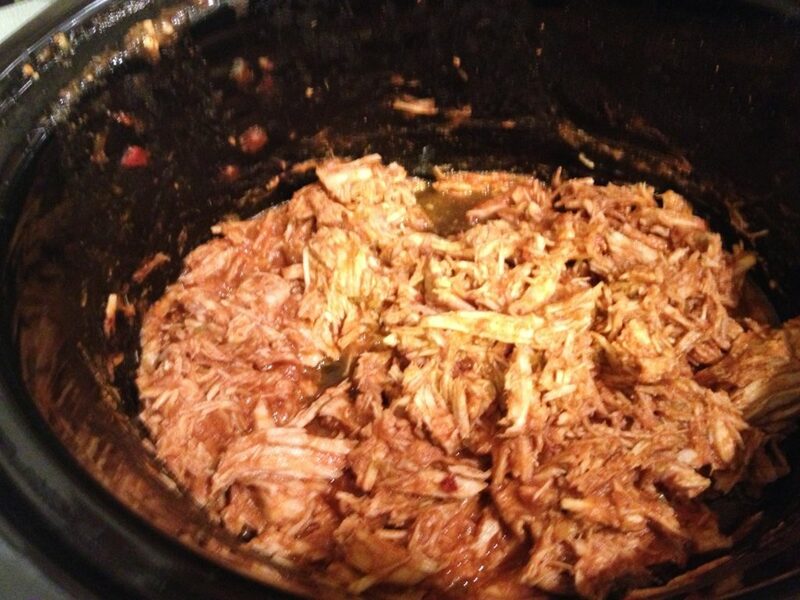 Generally, we cover them with barbecue sauce and put them in the crock pot for pulled pork sandwiches. The other go-to is to make tacos with them, also in the crock. So this time, I wanted something a bit different. While perusing Pinterest, I found a Barbacoa recipe. I suggested digging a hole in the back yard and throwing the pork roast in there to cook, but my husband looked suspicious. The dog, on the other hand, was all for that idea. So, we decided to go with the last interpretation of the term, and figured the crock pot was again a good way to go. I normally reserve trying new recipes for the weekends, when I have more time to prep and follow directions. Since this was a crock pot recipe, I figured I would prep it Sunday and cook Monday, so we could come home to a (hopefully) delicious dinner. So while my kid napped Sunday, I mixed up the marinade and sauce for the pork. This was extremely easy, and took all of 10 minutes to do. One word of caution – chipotle peppers in adobo sauce are REALLY spicy. Also, there are probably 5ish of them in a can. I stupidly thought there might only be one in the can, so I bought two. The recipe called for one of the peppers, plus chipotle chili powder. Since I only had regular chili powder, I thought I’d add a second chipotle pepper to enhance the chipotle flavor. Even so, I definitely didn’t need two cans of those peppers. I still have a container of them in the fridge, and have no idea what to do with them! I defrosted my pork roast for about 5 hours, just until it was thawed enough that I could cut off the layer of fat on the top. I found it really easy to cut it off while the pork was still partially frozen. Then, I stuck it and the marinade in a bag and put it in the fridge overnight. Monday morning, while getting ready for work, I threw everything in the crock pot and turned it on. This was where I screwed it up. 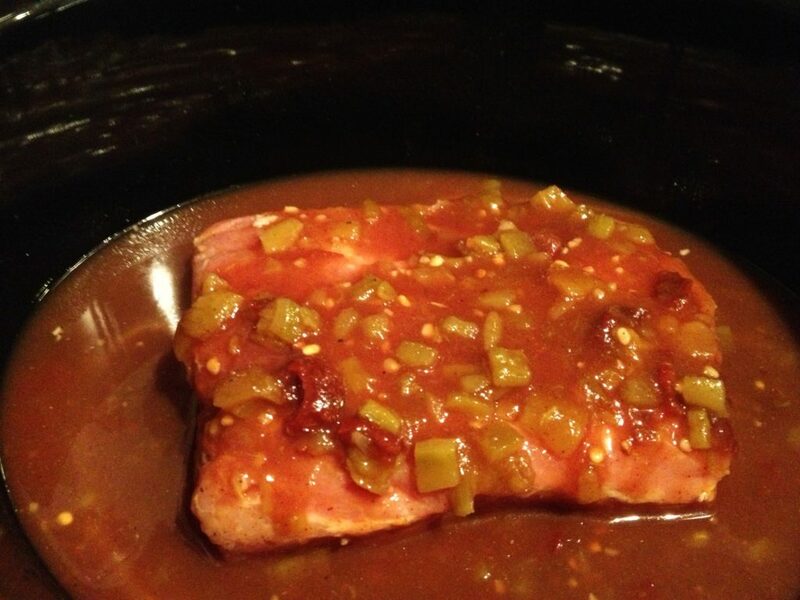 I dumped the pork and its marinade in the crock pot, and then as I was pouring the sauce in, thought to myself, wait a second, maybe this sauce goes in AFTER it cooks. It was too late, so I dumped the rest of the sauce in there and then looked at the recipe. Not only was that the case, but I was also supposed to cook the pork in the marinade, and then dump the liquid before adding the sauce. If there’s one thing I’ve learned from playing around with recipes, it’s that it is pretty hard to make something completely inedible. So, I programmed my crock pot for 7 hours on low, and left for work. When I got home, the house smelled AMAZING. 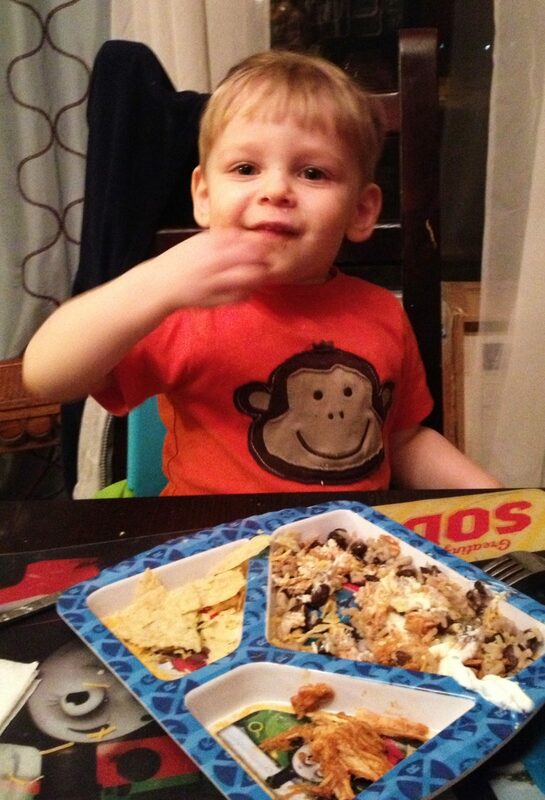 As soon as my 2-year-old entered the house, he exclaimed, “I try it?” As I suspected, the sauce was way too thin. This was because of my mistake. I hate to throw away flavorful cooking liquid anyway, so I was actually kind of glad it worked out that way. I grabbed a can of tomato paste to thicken the sauce, and put it into the crock. After letting that melt in, the sauce was thicker. I tasted it, and it was really good, but fairly spicy. And, I was afraid of any of us getting bites of chipotle. So, I threw the sauce in my blender and pureed it. This gave it a very nice consistency, velvety and smooth, and thicker than before. It also leveled out the spiciness nicely. After this, I shredded the pork, put it back in the crock, added some of the sauce (I had way more than I needed), and turned it on warm until we were ready to eat. I had enough sauce leftover to freeze and use for another batch! My husband added extra sauce to his, since he likes things extra spicy, and that worked out well. 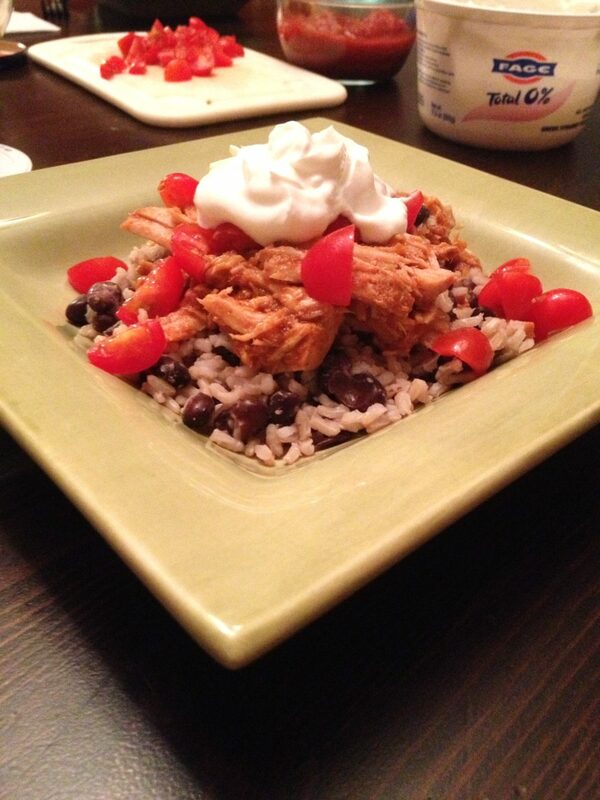 We served the pork over brown rice and black beans, and topped it with cheese, light sour cream, and fresh tomatoes. I have no idea what Barbacoa is supposed to taste like, but we’ve labeled this recipe a success! Maybe next time I will actually follow the directions, but I liked this version very much, so I must just continue doing it this way. Once it was mixed with the rice, beans, and toppings, it wasn’t spicy at all. Adding the extra sauce was great for the adults in the house, and without it, it was mild enough for my kid to eat (although he likes curry, so he might not be the best representative of the average toddler). 1. 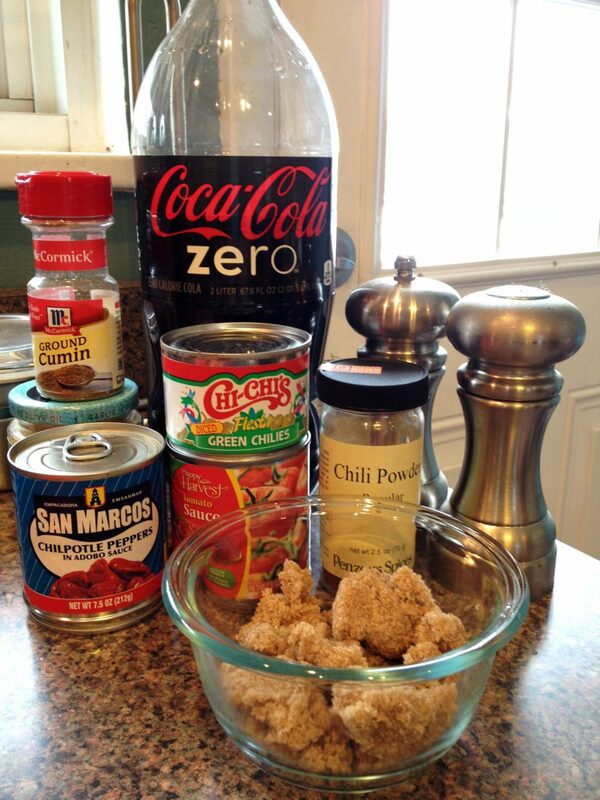 Mix all ingredients together and place in a gallon size bag, or directly in your crock pot. Refrigerate at least 2 hours, or overnight. 2. Cook on low for 7-8 hours, or high 3-4 hours. 3. Serve with rice and beans, and/or in tortillas, or any way you want! This sounds great! I had the same issue with the chipotle peppers. I froze them in a baggie and just tear one off and throw in the crockpot when I’m making chicken tacos.